North and South Korea have remained technically at war since 1950. However, inroads made by South Korean companies over the past decade had kindled hopes of a reconciliation. 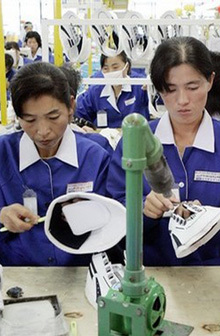 A joint industrial zone on the North Korean side, Gaeseong , where 88 South Korean companies employ approximately 33,000 North Korean citizens, has been steadily built up over this period. Another North Korean site, Geumgang-san (a.k.a. Diamond Mountain), has been developed into a thriving international tourist attraction by South Korean companies, most notably Hyundai. Over the past month, however, the North Korean government has effectively closed down these operations. Geumgang-san has been completely emptied, with South Korean companies forced to abandon the capital investments they have made there over the past ten years. Train service to Gaeseong has also been terminated, with roughly only a quarter of the 4,000 South Koreans employed there permitted to continue crossing the border. Gaesong may be be shut down completely in the months to come. As reason for its decision, the North Korean government cites "reckless confrontation" from South Korea as being "beyond the danger level." More likely, this event is a reaction to a deteriorating relationship with the South, particularly Lee Myeong Park's administration, as well as the covert distribution of anti-communist pamphlets in the North by South Korean groups. Why are South Korean companies quietly abandoning their hotels and factories at the 'request' of the North Korean government? This an eloquent illustration of the precariousness of doing business in a socialist regime. All governments hold the monopoly on force within its given territory, and the North Korean government in particular isn't one to shy away from its use. Just last July, a 53-year-old South Korean tourist was shot in the back when she inadvertently entered a military section of a beach at a Geumgang-san resort. As a totalitarian government, the DPRK exercises the greatest possible degree of regulation and control over the behaviour of its citizens and guests, including economic activities, through the use or threat of force. If we attribute the North's decision partly to the proliferation of anti-communist and pro-democracy literature by South Korean groups, we can make certain inferences regarding how it does and doesn't legitimize its political influence. We may infer, for instance, that there is very little legal-rational basis for its authority. The exposure to democratic ideals would hardly pose a threat to a government whose power and influence had been gained by following widely accepted and transparent procedures. From all accounts, the North Korean government continues to legitimize its authority on the basis of the (real or fictionalized) charisma of its leader, Kim Jong Il. Furthermore, by reminding citizens of the horrors of Japanese colonization, perpetuating widespread fear of the outside world, and idealizing North Korean independence, theDPRK is able to achieve even greater legitimacy among a brainwashed citizenry. The failure of South Korean companies to firmly establish long-term commerical investments in North Korea exposes some limitations of globalization. From this particular case, we could hypothesize that an integration of political processes is prerequisite to that of economic processes. The ideology by which the DPRK continues to guide itself, 'Juche' (self-reliance), is a purely isolationist ideal. As inspiring as it was during the recovery from a long and cruel Japanese occupation, it isn’t the least bit conducive to international commerce. Nor does the complete absence of individual rights bode well for the reception of capitalist ideals. Other contemporary examples, such as Venezuela's nationalization of its oil industry, suggest the same consequences of an economic ideal, capitalism, outpacing its political precondition, a guarantee of individual freedoms. Whereas globalization has increasingly transferred political authority to international bodies, such as the United Nations, we see none of that in North Korea. The DPRK retains complete control over the social, political, and economic sphere within North Korea, and makes no pretense at subscribing to globally-recognized standards of liberal democracy. Last month’s blatant expropriation of South Korean assets highlights the extent to which North Korea's political processes fall outside of what we now come to take for granted. Teaching Illegally -- Risky, But Wrong?